Gaylord Probasco Harnwell was born in Evanston, Illinois, on September 29, 1903, the only child of William Harnwell, a lawyer, and Anna Jane Wilcox, a playwright. Harnwell grew up in Frederick, Maryland, where he attended public schools before enrolling in Haverford College in the fall of 1920. He earned the degree of Bachelor of Science in Physics with the Class of 1924 and was a member of Phi Beta Kappa. After graduating, Harnwell was granted Haverford’s lone annual Cope Fellowship, which he used to study physics under Ernest Rutherford at the Cavendish Laboratory in Cambridge, England. In 1925, after a year in England, Harnwell returned to the United States where he enrolled in graduate courses in physics at Princeton University. Harnwell earned a Master of Arts degree in 1926 and a Doctor of Philosophy degree in Physics the following year. In 1927, Harnwell married Mary Louise Rowland. The couple went on to have four children and ten grandchildren. After earning his Ph.D., Harnwell spent a year conducting research at the California Institute of Technology, followed by another year of research at Princeton. In 1929, he was named assistant professor of physics at Princeton. Seven years later, he was promoted to associate professor — a position he held for only two years. While working as a professor at Princeton, Harnwell wrote the first of his many textbooks in advanced physics which were frequently used in college and university classrooms nationwide. In 1938 Harnwell was named professor of physics, chair of the Department of Physics, and director of the Randal Morgan Laboratory of Physics at the University of Pennsylvania. Harnwell held these positions for fifteen years, during which time he did much to improve the standing of the physics department at Penn. He hired numerous renowned physicists and secured new means of financial sustenance for the department, allowing for the purchase of the latest materials necessary for advanced research. 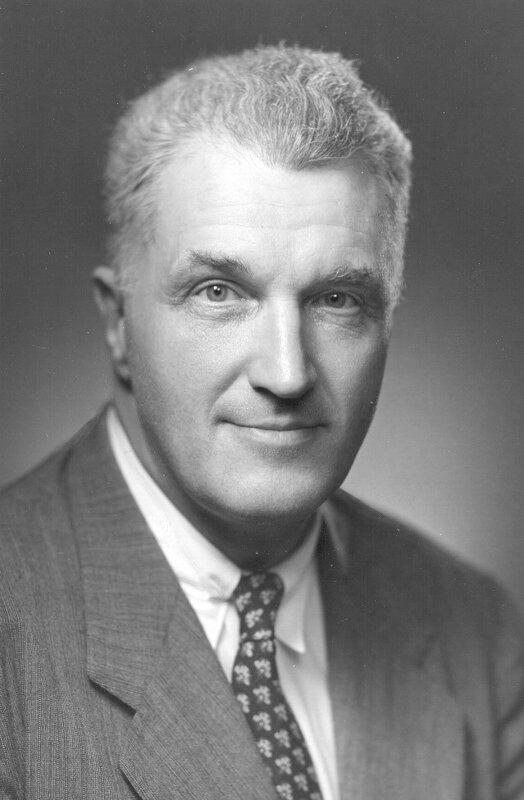 During his time as the Chair of Penn’s physics department, Harnwell served as editor of the Review of Scientific Instruments of the American Institute of Physics from 1941 until 1953 and editorial director of Physics Today from 1951 until 1953. He also served as professor of radiological physics at Penn’s Graduate School of Medicine. Harnwell took a leave of absence from 1942 until 1946 to direct the University of California Division of War Research at the U.S. Navy Radio and Sound Laboratory in San Diego, California. Harnwell and his staff focused mainly on the detection of enemy submarines, using sonar technology. In honor of his success and the advances he and his staff made in the field of sonar technology, Harnwell was awarded the Medal of Merit in 1947 and the Navy Distinguished Public Service Award in 1958. His work with the Navy gave Harnwell the opportunity to chair the Ordinance Committee of the Research and Development Board of the Department of Defense from 1951 until 1953 and the Committee on Undersea Warfare of the National Research Council from 1950 until 1955. In 1953, the trustees of the University of Pennsylvania named Harnwell to replace outgoing President of the University, Harold Stassen, who had taken a position in the Eisenhower Administration. Harnwell served as Penn’s president until 1970. His tenure was remarkably successful. He increased the number of faculty on campus, presided over a substantial increase in the average SAT score of the incoming undergraduate freshman class and the physical size of the campus, worked to better balance athletics and academics for student athletes, brought foreign diplomats and leaders to Penn’s campus, raised over $100 million which aided in the construction of 93 new campus buildings, placed renewed emphasis on graduate programs, pushed the Wharton School to admit women, ended Penn’s involvement with classified military research, and often met with trustees and groups of students and faculty to discuss their differences face-to-face all while he continued to teach an undergraduate physics class. Harnwell was known for maintaining an active interest in Penn’s undergraduate students and was so well liked that a joint student/faculty group unsuccessfully tried to convince him to run for mayor of Philadelphia in 1962. During his time as president, Harnwell also focused on Penn’s relationship with West Philadelphia and particularly its immediate surrounding neighborhood of University City. For 18 years, Harnwell was chairman of the board of the West Philadelphia Corporation. He also worked toward the development of the University City Science Center and actively tried to convince faculty members to live in West Philadelphia. Harnwell’s dedication to the City of Philadelphia was not, however, restricted to West Philadelphia; he also spearheaded a successful movement to restore Philadelphia’s historic City Hall. During his presidency, Harnwell did not limit his considerable energies to Penn or Philadelphia; he served as the first chair of the Council of Presidents of Universities Research Association in 1965 and 1966, as chair of the board of trustees of the Carnegie Foundation for the Advancement of Teaching in 1968 and 1969, as the public governor of the New York Stock Exchange from 1965 until 1968 and on the board of the Pennsylvania Railroad and its successors from 1958 until 1970. In 1958 he traveled to the Soviet Union for the State Department to observe the Soviet University system. Harnwell later wrote a book on his travels excerpts of which were serialized in Philadelphia newspapers upon his return. Harnwell was a member of numerous academic societies during his lifetime and was awarded 34 honorary degrees including the honorary degree of Doctor of Laws from the University of Pennsylvania in 1953. He was also named an Honorary Commander of the Order of the British Empire, an Honorary Fellow of the Royal Society of Edinburgh, and Commander of the National Order of the Republic of the Ivory Coast. Harnwell died in Haverford, Pennsylvania, April 17, 1982.